International Business 13 Edition Enriched with maps, photos, and the most up-to-date world data, this text boasts the collective expertise of five authors with firsthand international business experience, specializing in international management, finance, law, global strategy, and marketing a claim no other text can make. In addition, each new copy of International Business, 13/e includes access to CESIM an interactive IB simulation developed for industry professionals. Ball, et al is the only textbook on the market which features access to CESIM. 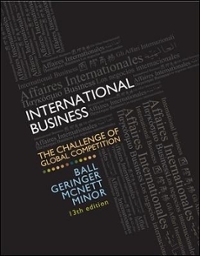 Only Ball, McCulloch, Geringer, Minor and McNett can offer a complete view of International Business as diverse as the backgrounds of business students.